(L - R) Dr. Gordon Court - Provincial Biologist, and Kim Blomme - Wild North, accepting donation from Carol and Rollie LaMarche, co-owners of Picture This. 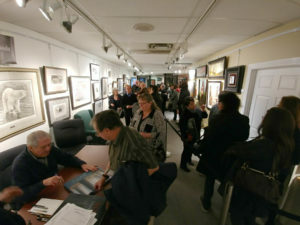 Picture This Gallery is proud to donate $1040 to Wild North – Northern Alberta Wildlife Rescue & Rehabilitation. Wild North is a charitable organization that provides compassionate care for injured, contaminated, and orphaned wildlife. They have been serving Edmonton and surrounding communities for over 25 years. 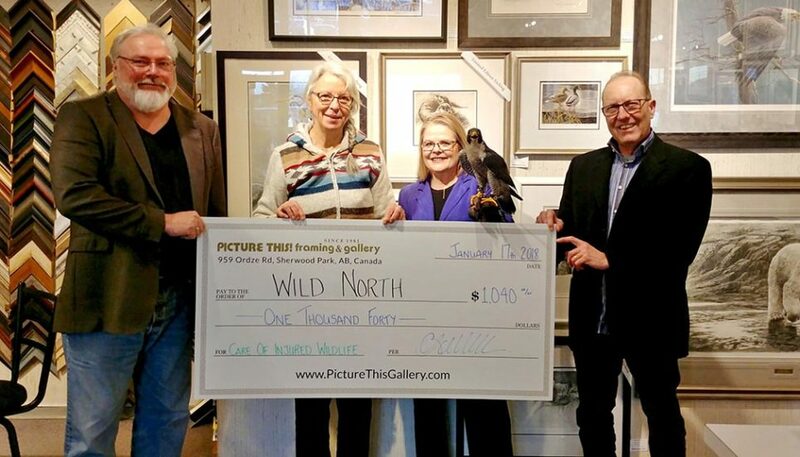 Rollie and Carol LaMarche, co-owners of Picture This, presented the donation to Kim Blomme, Director of Wildlife Services at Wild North and provincial biologist Dr. Gordon Court, who has been involved in restoring the Peregrine falcon population around Edmonton. Also featured in the photo is a surprise guest, Vinny the Peregrine falcon. See if you can spot him! Vinny, due to an injured wing, is under the care of Wild North, and one of the over 20,000 birds and small mammals Wild North has helped over the years. 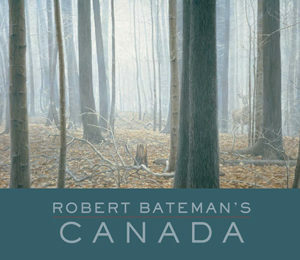 Picture This Gallery’s donation to Wild North is made possible with proceeds from the Robert Bateman special event: Celebrating Canada 150 – Robert Bateman’s Canada. 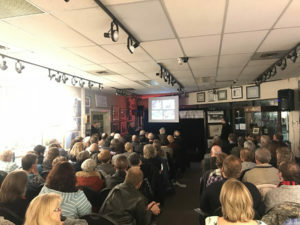 This talk, art show, and book signing with acclaimed Canadian artist and conservationist Robert Bateman was completely sold-out. Established in 1989, Wild North is committed to environmental stewardship by providing care to wildlife in need. Every year, over 2500 wildlife patients, including over 150 different species, are treated by Wild North. Immediate treatment is provided at the wildlife hospital with the help of a network of volunteer veterinarians. Additionally, long-term care is provided at a rehabilitation center where patients are guided through the recovery process until release.